You often search for a message of which you remember just half the details. But you know that this message has a file attachment, or was sent in a specific period. In Version 3.1 and higher, Thunderbird has an easy search field above in the program window. Enter a search term there. From the third alphabet onwards, Thunderbird shows the relevant email addresses. You can thus add an address with just a click. Else, you can end the entering of the search term using Enter in order to carry out a complete text search in all accounts. 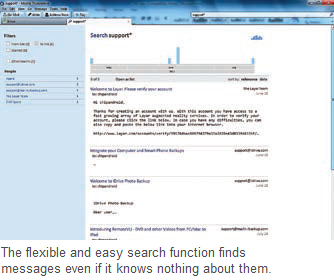 If you do not find a suitable search term, use a part of the mail address followed by an asterisk as a placeholder. The search result is in a new tab. There, you can activate the filter to the left and view messages with “Attachments”. You can also select a specific contact from the displayed list of frequent contacts and limit the search to one inbox folder or one email account. A recent development is the convenient time-related search limitation. For this, click the diagram icon above the search term. A gradient time bar shows the frequency of the relevant emails according to time by means of bars. By clicking the individual gray bar sections, you can refine the month and the year. Then click a blue diagram bar in order to see all the relevant messages from this time period. You can thus for instance quicklyfind a file attachment that you received on your birthday, even if you no longer know who sent the email, which account it was received in and also in which folder was stored.